Spaghetti squash spaghetti dinner! Yum! We had this surprisingly delicious dish last night. A new staple! Remove and cut in half lengthwise. Scoop out and remove the seeds from the center. Take a fork and shred through the squash. 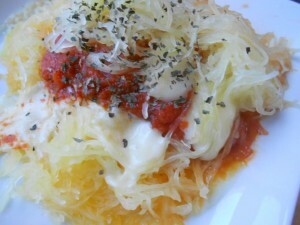 Arrange the spaghetti squash on a plate. Top each plate with ½ cup sauce, ½ of the cheese, and a dash or two of oregano. This recipe uses ½ of a small-medium sized spaghetti squash per serving.